Digital Marketing AgencyBlogIs your website “telling” or is it “selling”? Know the difference and prime it for leads. The fact that you need to sell on the web is a given. To sell you need to persuade. Persuasion is a process. To persuade you need to understand consumer motivations and behaviour. You then use the insights from this to weave together your persuasion. The weave uses copy. In that sense, the web is more a direct response medium than it is an advertising medium. You create awareness, change attitude, strengthen the intention to buy, answer objections, and address misnomers. All in the same piece, or page. To do this well, we need tried and tested heuristics that work for us. Luckily, direct marketing copy comes to the rescue. You get proven, tested frameworks that you can use. We then refine, test, and confirm the frameworks as we experiment with it. You need a website, or at the least a Landing Page, with the persuasion in place. You then drive targetted traffic to these pages using a variety of media. Leverage social media outreach. It brings traffic via influencer mentions, shares, likes, and links. The moot point in all this is that you need to persuade to sell. This article show you how to spot the difference between tell and sell and what you can do about it. What comes first, persuasion or promotion? Without persuasion, all your promotion will be a waste of time, because it won’t convert. When you promote, you manage to get in the traffic. How well you convert the traffic into leads is a function of your persuasion. So persuasion comes first. Followed by promotion. But, how do you persuade better, convert well, and get leads from your online properties? What is persuasion and how does it play out on the web? There are two types of Websites and Landing Pages that you will come across online. One is the tell format. The other is the sell format. Persuasion happens with the latter, not the former. Once you know the difference between the two, you will be able to persuade better. Persuasion will get you better results online. What is wrong with the Tell Format and why won’t it work? This format goes against the basic tenets of marketing. Customers come to your website to solve a pain, problem, or need that they have. Your job is to help them solve it better than what anybody else can. Customers couldn’t care less about how great you are. Or how many awards you have won. Or how many employees and offices you have. Or what accreditations you have. Or what you do, except in the context of the problem that they need to solve. When your persuasion moves away from this ideal you miss the mark. You fail. Convert less. You get poor ROI from your online investments. This is why we recommend the sell format over the tell. What is the Sell Format of Persuasion? What is the customer pain/ problem/ need/ pain that you solve? As Theodore Levitt said: People don't want to buy a quarter-inch drill, they want a quarter-inch hole. How do you solve this customer problem? Why should the customer buy your brand over others? What social proof do you have to prove your trust and authority? What happens if the customer did not buy your product? What is your plan/ process explanation to get the customer to buy from you? What response do you want from the customer? If you can write to this framework, you are well on your way to selling and getting leads. 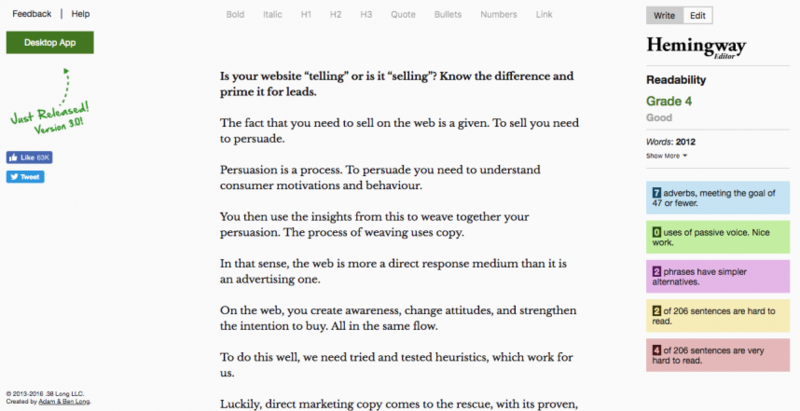 Want a detailed note on the copywriting formulas on the web? Browse through Joanna Weibe’s excellent collection of copy formulas. Why does “sell” work better than “tell”? Sell works because it’s based on customer insights. It then addresses these quickly. What is this product and how does it help me? Why should I buy this product from you? Why should I believe anything that you say? What is the plan/ process for buying this product/ service from you? Tell massages bloated egos. It does not solve the customer problems. Customers have to deduce, interpret, and divine what you say. No customer has the time, or the energy for this. The onus is on the marketer to clear all doubts. You have to answer all the objections. Tell yields poor results. It also means that by using tell you’re leaving money on the table. Why is “tell” so common, when it is “sell” that really works? There are many reasons for the abundance of tell, on the web. Sell copy has its origins in direct response advertising. Not advertising. Many copywriters at digital agencies aren’t clued into Direct Marketing Copywriting. Most copy folks come from advertising into web copy. Armed with an ability to write, sans any techniques. The ignorance shows. The usual thing most web agencies do with copy is to get the basic text from the client. Then pump it up with adjectives, in the name of sell. Some spruce it up with better grammar, not better sell. Many clients and agencies believe that web copy is about writing well [syntactically correct grammar]. It isn’t. Many haven’t yet adjusted to the fact that the web is a direct response medium and not an advertising medium. Advertising, because of its space and time limitations, plus expense, compresses copy. The web expands it. Advertising looks for one USP that benefits the largest number of customers. The web is capable of addressing all types of customers, with different USPs. Except for the big names in marketing, advertising folks rarely ever test before roll-out. The web makes it easy for us test our propositions, gather insights, and work way faster. Companies that have a better grasp of technology than communications also create websites. It’s not the same thing. A website is after all a set of pages strung together in a CMS, right? The truth is that almost any technology will do for websites. Persuasion is what companies need to focus more on. Many clients are reluctant to pay more for copy that sells because they are not sure how it translates into ROI. Clients do not understand what it takes to be good at the craft. Unless it’s a Landing Page, you won’t see results too soon, would you? Unless you test it, and pour over the analytics, you would not understand how web pages convert, would you? Most clients can’t tell the difference between an agency that knows how to communicate, and one that has no clue. These end up with the copy they deserve. Apart from sell and tell, what else should I pay attention to in my copy, or design? You need to keep your sentences short. You audience needs to grasp it. It should be shorn off adverbs. You must write in active voice and present tense. Happily, there is a tool that helps you do this well. The image below shows the readability grade for this article, using HemingwayApp. It’s at Grade 4, which is good. Take any piece of copy from your website. Paste it into the HemingwayApp editor. You will see highlights in red and yellow. Correct these. Hemingway also gives you a readability score for the copy. The lower the readability score the better the chances of comprehension. The second tool to use is Grammarly. Grammarly corrects your syntax and punctuations for you. Even the free version of Grammarly is very useful for testing your copy. Can I see some examples of tell and poor grammar? The web is full of tells. Tell follows its own structure. It is replete with we, our, us kind of copy. Sell websites distinguish itself with the proper use of “you”, and “yours”. Read the copy below. Spot the laboured, flowery, incorrect use of adjectives and superlatives. Can I see some examples of websites that sell? Take a look at the following websites. Observe the flow of persuasion in it. Understand the structure and the elements within it. In all these examples you’ll see the elements of the sell framework outlined earlier. Does your website tell or sell? What can you do about it? Now that you have an idea of the persuasion construct, check out your website. Judge if it’s tell, or sell. Use the framework for the sell format of persuasion. Judge it. Look at the examples of the sell websites we have put together. Assess how your website compares with these. Does it follow the sell framework? Any explainable framework? Is it free of errors when tested through Grammarly? Is it free of errors and readable when passed through Hemingway? Need a Done-For-You persuasion audit? Wish to put it in place for you? If you think sell is a task that’s best left to experts, now that you know what it takes to craft it, talk to us. 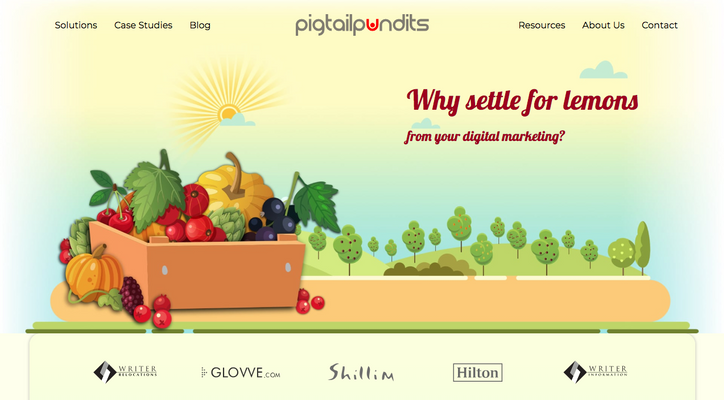 Pigtail Pundits guarantees you results with copy that sells. We audit your sell. We compare it with your competitors. We pitch it against the the best in the business. This results in a strategy that’s superior to what’s there in the market. Of course, we also help you put up the persuasion on your website, or Landing Page. Want us to take a quick look at your website? Advice you on it? Each month, we randomly select 5 websites for a free evaluation. Who knows, your website or Landing Page might just get lucky.